Winnipeg, MB– What is behind the “mystery of goodness” that leads people to accomplish great deeds for the sake of others? That was the underlying question that connected Rwandan anti-genocide activist Stephanie Nyombayire to Sir Martin Gilbert, world renowned historian and Holocaust expert in the film, The Rescuers. The stirring and inspiring documentary The Rescuers follows the two unlikely partners as they delve into the past and get to know the stories of heroic non-Jews who saved Jews during the Holocaust. The Rescuers is different from other films in that it ties the Holocaust history to contemporary genocides – which hits close to home for our young activist, Nyombayire, as much of her family was murdered during the Rwandan genocide in the 1990’s. 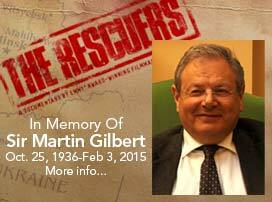 Sir Martin Gilbert on the other hand was among the children evacuated to Canada during the Battle of Britain, and he went on to write definitive histories of the Final Solution. Over the course of three years, Emmy award-winning director Michael King and his crew followed Nyombayire and Gilbert across the globe to far flung locations, including the Greek island of Rhodes, England, Hungary, France, Poland, Germany, Denmark, Israel, Lithuania and Rwanda. Nyombayire and Gilbert talk to survivors, their descendants, and embassy and museum officials who share the hidden history of bold diplomats and the people they saved. Some of the stories are well known but most of their tales have remained untold until now. Nyombayire and Gilbert explore and contemplate the past in a quest, in part, to understand what should be done to stop the ongoing genocide in Darfur and elsewhere. The Rady Jewish Community Centre is proud to present a special screening of The Rescuers during Tarbut – Festival of Jewish Culture on Sunday, November 13 at 7:30 pm. Emmy award winning filmmaker Michael King will be there to introduce the film and will hold a post-screening Q & A session. The Rescuers is quickly catching everyone’s attention and is even being touted as an Academy Award contender for Best Documentary Film. The film has also been picked up for North America distribution in early 2012. “We are very excited for this opportunity to showcase this special film with our Winnipeg audience. We are especially honoured to have Michael King come in for the festival screening and spending time with us for a discussion of the film. The Rescuers promises to be a deeply moving film – the stories of the few intrepid who sought to save others are inspiring and their stories are truly worth sharing, ”comments Tamar Barr, program director for the Tarbut Festival and Rady JCC. Tickets for The Rescuers are available through Rady JCC online at www.radyjcc.com or by calling477-7510. Mr. King’s has produced, directed and written documentaries, music videos and a feature film for the last twenty years. In 1991, his MTV music video on Dr. Martin Luther King’s speech “I Have A Dream” received national recognition. He later produced, directed and wrote a PBS documentary in 1995 called “Making A Living the African-American Experience” featuring Joe Morton. In1997, he directed and wrote his first feature film “Vanity Kills“ in the Czech Republic. In 1999, his PBS documentary on ‘Youth Violence in America’ entitled “Bangin” won the1999 Emmy and International Television and Video Association Award for ‘Best Documentary’ and ‘Best Editing’ featuring Chuck Dof Public Enemy. In 2007, he directed and produced a feature documentary entitled “Rapping with Shakespeare” at Crenshaw High School in South Central Los Angeles and was nominated for 2008 A&E Spotlight Indie Filmmaker Award. Mr. King is a graduate of Connecticut College, BA in Government; University of Amsterdam, MA in Film Studies; and the Amsterdam School of the Arts (Maurits Binger Film Institute) Postgraduate Degree in Feature Film Directing. He also taught for two years at Emerson College, Screenwriting and Novels into Film. Recently, he was the Filmmaker-in- Residence and Professor of Film at Lynn University in Boca Raton, FL. Mr. King is a former board member of the International Documentary Association and a member of the Director’s Guild of American. In 2009, he was awarded Switzerland’s Carl Lutz’s Medal of Freedom and Connecticut College’s 2010recipient of the Harriet Buescher Lawrence ’34 Prize for his lifework in film and television. The Rady JCC is Winnipeg’s leading fitness and cultural facility open to all. The bright and modern 54,000 sq. ft. facility offers something for everyone. An extensive array of sports, recreation & fitness programs for children, youth, adults and older adults, coupled with a broad spectrum of cultural, social and educational programs offered in a welcoming atmosphere truly make the Rady JCC everyone’s “home away from home”.